You can use Premiere to merge videos into one clip. You can sync audio and video together if they are recorded seperately before. In the Project panel or the Timeline, you also can merge videos and audio in group, which is a great functions. 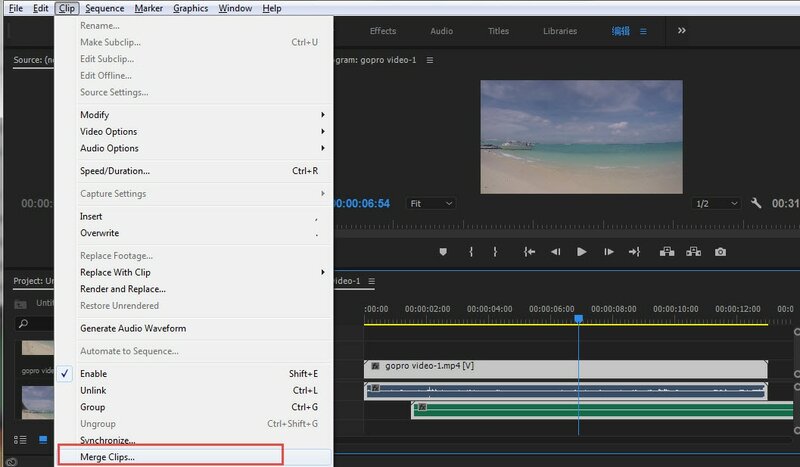 Do you know how to merge clips in Premiere? In this tutorial, we are going to show you how to combine videos clips as well as audio clips in Adobe Premiere Pro, you'll find the detailed steps below, and let me know your suggestion at the comment section. The problem here is that Adobe Premiere is for professional users, it can be time consuming and complex. If you're looking for an alternative software which is simpler to use but gives high quality results, then Wondershare FilmoraPro would be a convenient and efficient option. FilmoraPro allows you to quickly merge files without any quality loss. It offers 2 way to merge clips. One is on timeline to unlink the audio and video, and the other one is to merge video/audio on the media library. Easy to merge! Download it to have a try (FREE). Simply drag and drop the clip onto the timeline. Right click on the video clip to select unlink. If you want to merge video and audio together, just select both on media library. Right click on them and choose Merge video/audio. It is quite straightforward. The merged video and audio will appear a new video clip. Just drag it to timeline to edit it. To combine clips in Premiere Pro there are some basic steps that must be kept in mind. Combining video clips is called creating a nested sequence; this is quite a powerful process. First, you have to create a sequence and drag and drop the two clips that you wish to combine, into your workspace. Select another video clip and drop it onto the "new item" button. This will create another sequence that you can rename. The good thing about a nested sequence is that it can be re-edited and will automatically be updated in all other sequences as well. Now, with the latest version of the software being introduced which is Premiere Pro CC it has left its previous version CS6 behind in a few categories. The new updated version introduces added features such as morph cut, color workspace, multi project workflows, GPU optimized playback, Creative Cloud libraries etc. All the new features of the latest version help enhance the user experience. 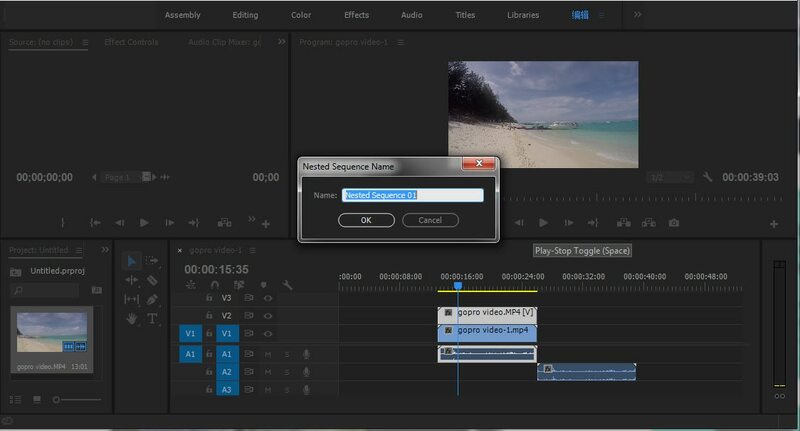 The command provided by the Adobe Premiere Pro CC for synchronizing video and audio clips is called "Merge Clips". The clips that you originally start with before merging them are called the component clips; they make up the singular merged clip at the end using the Merge Clips function. Only one video clip can be merged with a maximum of 16 audio tracks. So, you first select the video clip and then shift or control click (for Mac OS command instead of ctrl) to select the audio clips which are required to be merged. The Merge Clips dialog box will open; select your required setting and click "ok". You can also merge audio only clips using this method but not more than one video clip can be added. You can do the same in the project panel by dragging and dropping the required clips on the timeline panel instead, if you want to merge the clips on timeline. However the same command i.e. "Merge Clips" is used. Besides the basic features of syncing audio with video with the Merge Clips feature, you can always use the Nested Sequence feature to combine images to video clip. If you still feel it is difficult to merge clips in Premiere, you can use FilmoraPro to easily merge videos and audio together. If this article helps you, please share it and let more people know.